"The Galleries at Turney," designed by nationally acclaimed architectural firm, [merz]project, was chosen by the Host Committee of Greenbuild 2009 to be showcased as one of the feature projects during their planned Greenbuild Tours Arizona, with an audience of over 25,00 expected conference participants. 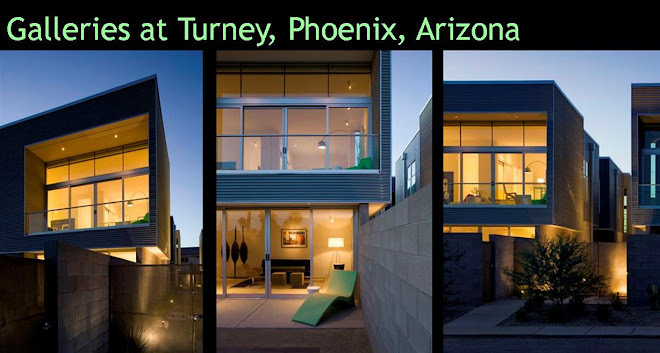 Galleries at Turney will be participating in the 2009 Contemporary Desert Living Tour, as part of the USGBC (United States Green Building Council) annual Greenbuild International Conference and Expo. The conference will take place in Phoenix, Arizona on November 11-13, with a guided architectural tour to wrap up the weeks' events on Saturday, November 14, 2009. One of the tours stops will be The Galleries at Turney, the first and only LEED-H (Leadership in Energy and Environmental Design) certified housing development in Arizona. Located in the Biltmore area of Phoenix, this unconventional, contemporary community consists of eight homes that boast considerable energy and water savings for its owners. The Greenbuild Conference Host Committee chose The Galleries at Turney to showcase the tour as the project exemplifies the relevancy to the Greenbuild 2009 idea - design which is truly innovative and environmentally responsible contributes to the community and creates a dialogue.